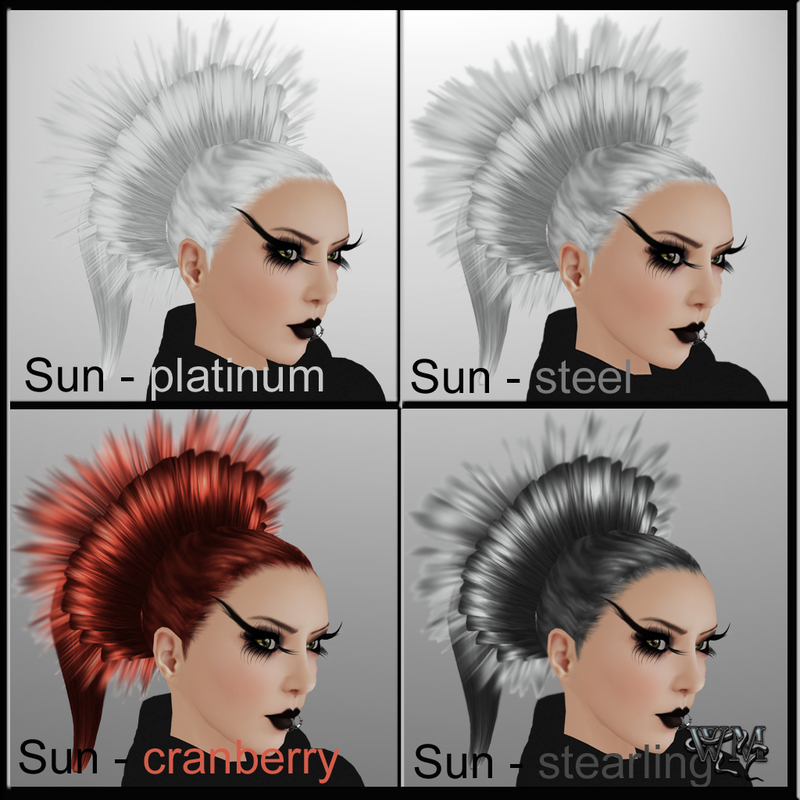 New hair attachments by PurpleMoon!!! A beautiful, extravagant outfit that can be worn with long or a short skirt. This first picture shows the long skirt version. Also you can choose between the huge neck collar or just that lovely necklace. The great necklace is also part of the whole outfit. The top is armless and has an amazing deep neckline that shows of the wonderful well-shaped cleavage. The skirt starts with an opaque part and goes down becoming more and more transparent. ‘The short version has the same great attributes as the long one, just the skirt ends after the awesome opaque part. The textures are amazingly detailed and in the front of the top you can see a sweet detailed zipper that decorates the top from the beginning, down to the belly. The great hair that I am wearing for this outfit is called “Era” and it is one of the new fantastic hair attachments of PurpleMoon. Poulet Koenkamp also created to every color the matching hair base what skips a lot of trouble finding the right color for the hair itself! The hair attachments are available in 20 (!!!) different colors with 20 (!!!) hair bases also. Unbelievable but true! 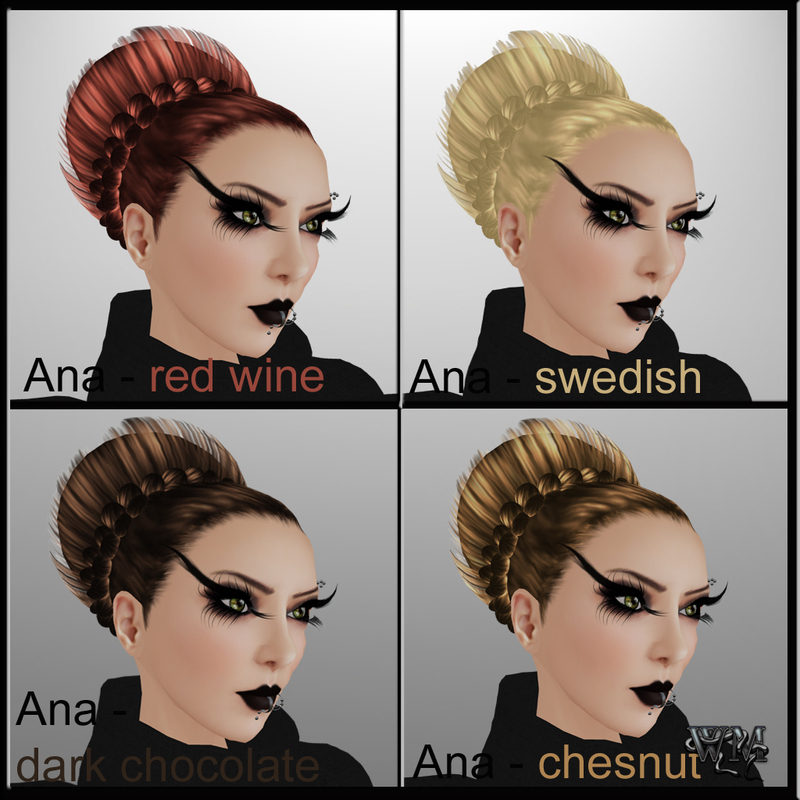 To cover all the wonderful colors I gave for every hairstyle a few colors naming them on the picture. 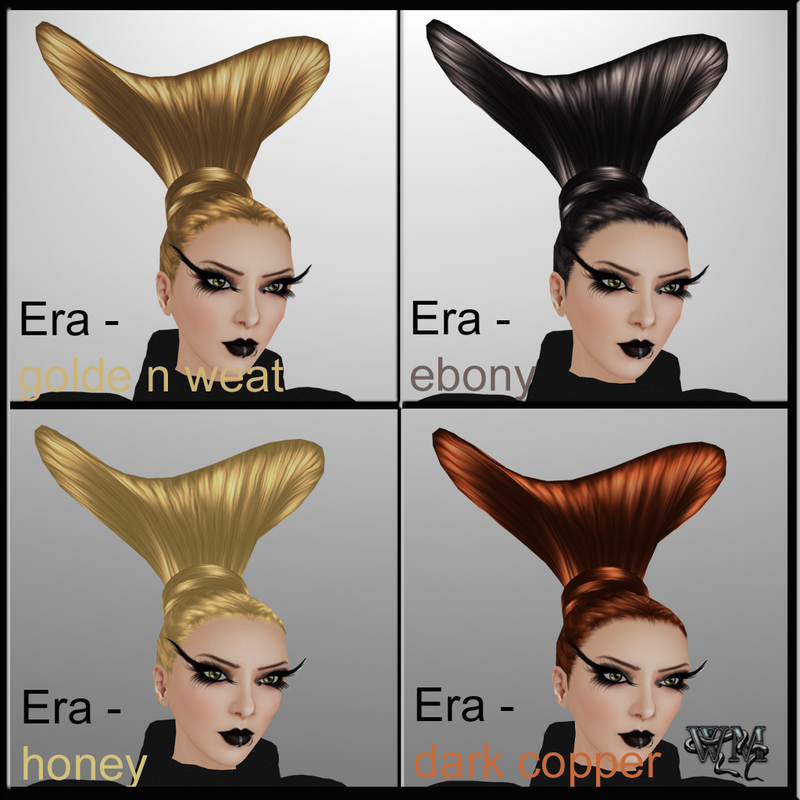 “Era” is an avantgardistic hairstyle that totally turns head with its extraordinary shape. 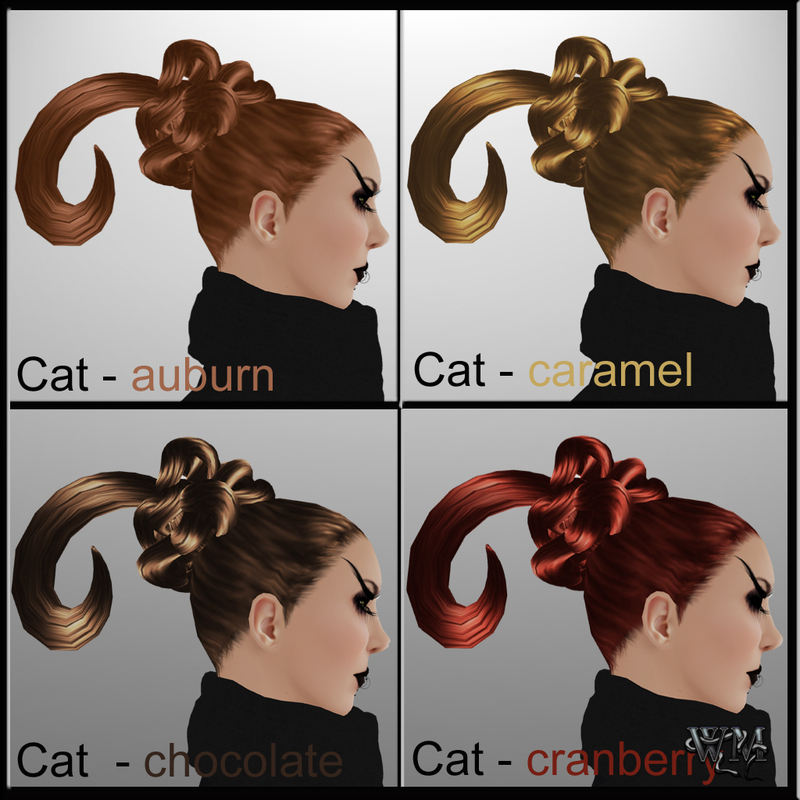 “Cat” is a great non usual updo, that again shows off the great designer skills and ideas of Poulet Koenkamp, designer of PurpleMoon. A sweet unusual knot at the back of the head carries a little neat curved ponytail. 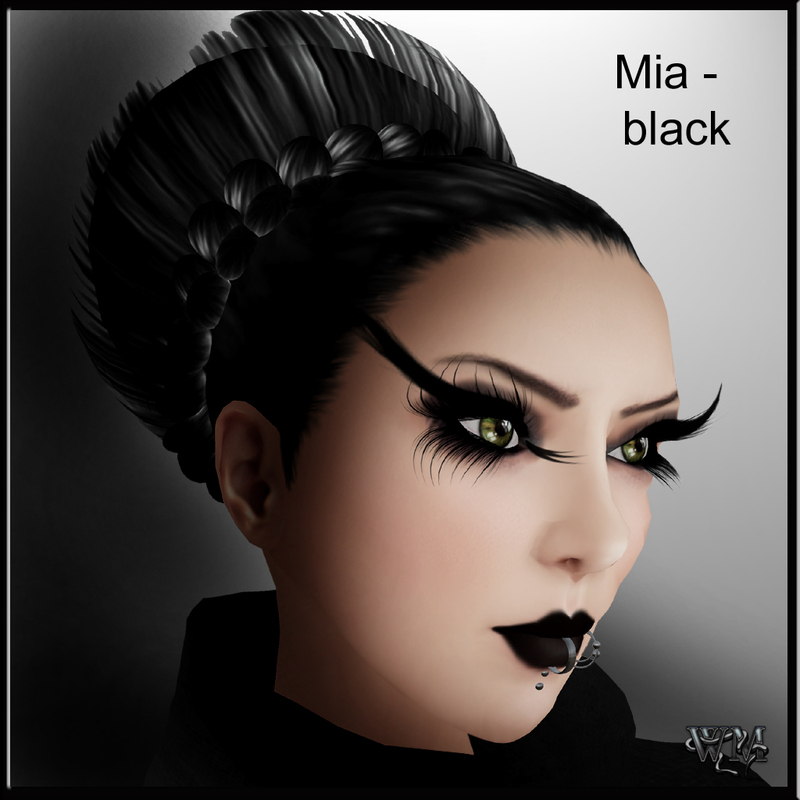 For the ones that like the longer hairstyles more PurpleMoon offers the “Mia” ponytail. A long ponytail that amazingly flexible moves with every step you take, hold by a sweet little knot at the back of your head. A very smart and neat hairstyle you can have with the “Sun” hair attachment. 2 rows of circled hair behind each other. The second row shows of neat wisps and leads over to the tiny ponytail in the back. Last but not least we have a wonderful elegant up do with “Ana”. Ana is a perfect addition to every ballgown or dress and it adds automatically the sophisticated and elegant note! This hairstyles are a totally must have for the modern and style loving fashionista. 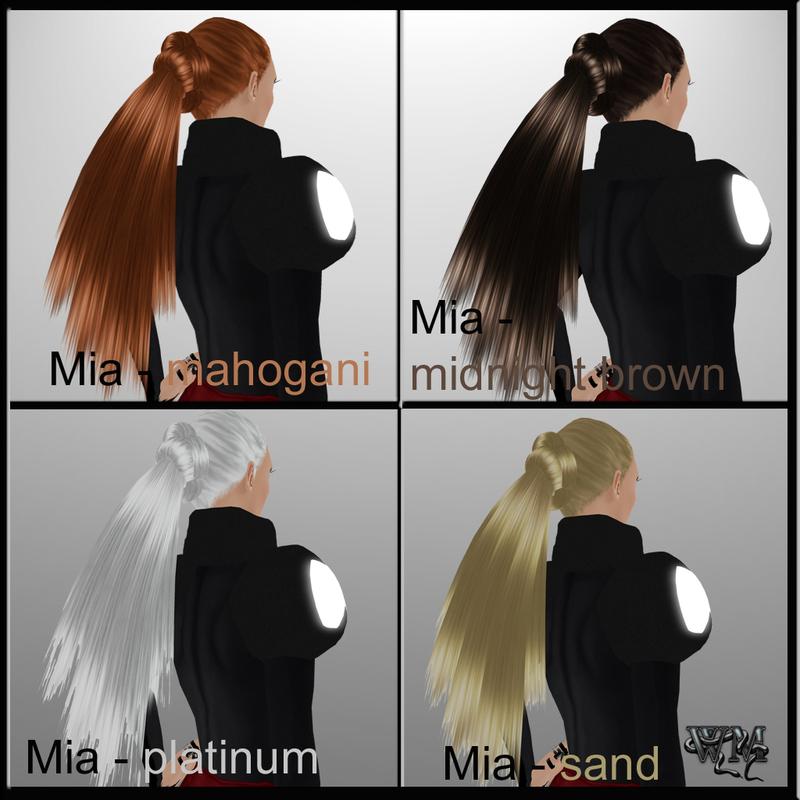 With all the colors I am sure you will find the perfect one for you anyways wich hairstyle 😉 The new hair is available in different color packs like “Blondes”, “Reds”, “Brunettes” and “Black & White” with five shades in each of them. Also, a fatpack with the 20 shades is available as well. All the packs include the matching hairbases. 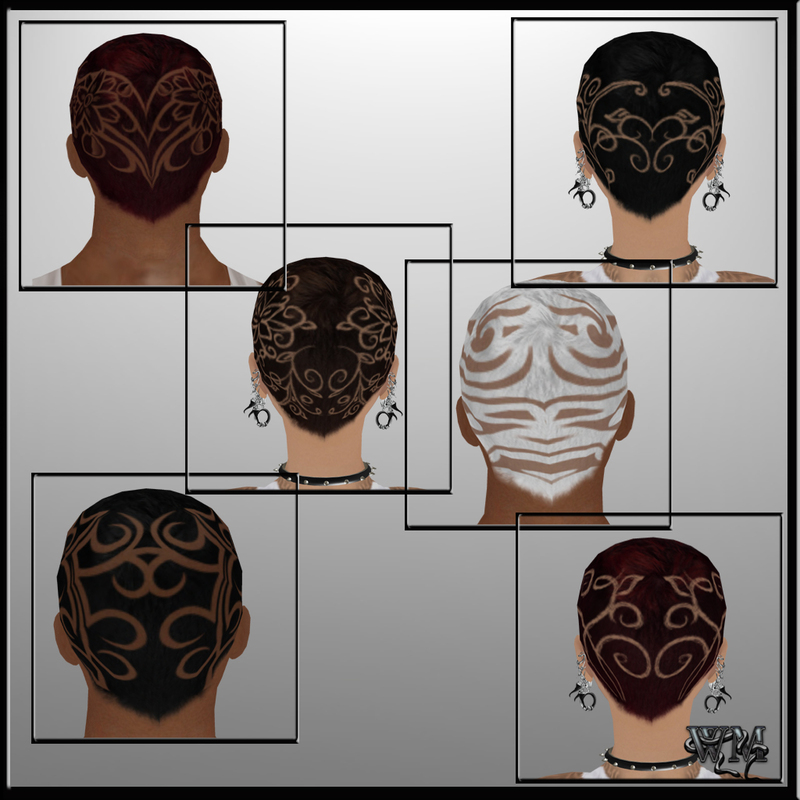 Keep in mind, that these tattoo layers will work on SL viewer 2 and compatible viewers.